April 5, 2018 | 5 p.m.
(Left to right) Hannah Fontaine ’18, Eli Schipper ’18, Xiaoshuo Liu ’18, Sam DeSautel ’19, and Associate Professor of Business and Economics Chuck Hannema pose for a photo at the CFA Challenge in Minneapolis. 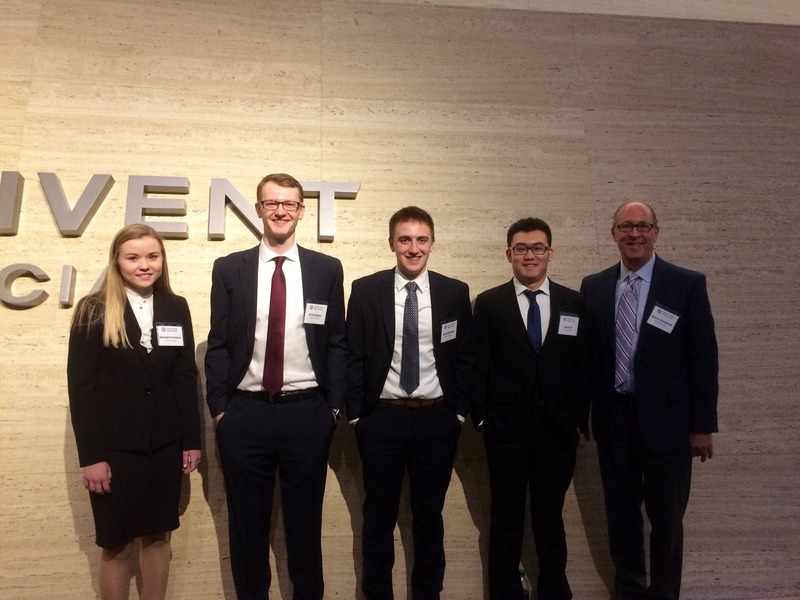 Bethel finance students Eli Schipper’18, Hannah Fontaine’18, Xiaoshuo Liu’18, and Sam DeSautel’19 tied for 2nd place at the 8th annual Upper Midwest Chartered Financial Analyst (CFA) Institute Research Challenge hosted by the CFA Society of Minnesota. The team first competed against 18 other teams from nearby universities in mid-January where they submitted a written report on equity research and an analysis on Fastenal, Inc., an industrial supplies company. The Bethel team plus four others were selected to move on to the next round of competition held at Thrivent Auditorium in Minneapolis, where they tied for second place with University of Minnesota Duluth. According to the CFA Institute website, the CFA Institute Research Challenge offers students a unique opportunity to learn from leading industry experts and compete with peers from the world’s top finance programs. This initiative promoted best practices in equity research among the next generation of analysts through hands-on mentoring and intensive training in company analysis and presentation skills. Students were able to apply what they learned in class to this hands-on challenge. Bethel students take general education classes in addition to courses for their major area of study, which helps to give them multiple perspectives to what they are learning. It also means that more than just finance students might be interested in teams like the CFA Challenge. 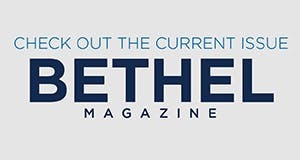 “Bethel teams often come from broader perspectives than just finance and that gives a richness to the analysis many other teams miss,” says faculty advisor Chuck Hannema, associate professor of business and economics. “The liberal arts emphasis of Bethel strengthens their preparation and is evidenced by consistently superior marks for their writing and presentation abilities”. The diversity of strength was also reflected in the team members. Liu said Schipper was good at valuation models and related financial information, while Fontaine and DeSautel were good at reading financial statements. Liu himself said he could add some economic flavor to the report and presentation to widen the scope. The remarkable team effort and student-faculty partnership all contributed to the success of this team. DeSautel ’19 valued the opportunity to participate in the CFA challenge. “[The field] is something I’m interested in pursuing after graduation and I wanted to get a good feel of what it could be like,” he says. Liu found the final presentation to be the most memorable part of the competition. He thought it was exciting to receive feedback from experienced professionals in order to learn what they had done well. Both Liu and DeSautel encourage other students to pursue experiences like this while at Bethel. “The CFA challenge and SMIF fund are good co-curricular activities that build off of great classes and provide good insight for students to determine which specific field they want to pursue in the future,” says DeSautel. “Don’t be content with just passing classes, take on those opportunities and improve yourself even further,” says Liu.